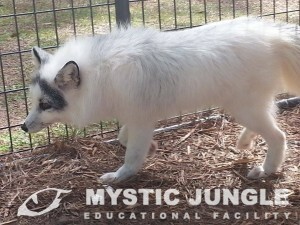 Coming to Mystic Jungle in fall of 2014, Tokala is an Arctic Marble Fox. At two years of age (4/2012) he is in now his fourth and final home. Tokala is not an Arctic Fox, but rather a red fox with a color variant. Bred for the fur or pet trade, their coats are valued in the coat industry, and because of their small size and easy domestication, are popular as pets.